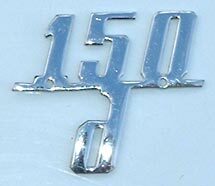 Perfect copy of the orginal legshield emblem on 150D models built from 1954-57. Chrome plated brass with integral mounting pins. Tool #1422.A recommended for installation.